SIGNED by Guillermo Del Toro (director/writer) & Nancy Holder (writer). There are very few of these that have also been signed by Nancy Holder making these even more of a rarity. This is a brand new, never read hardcover book. This limited edition novelization has been carefully opened to be signed by author Nancy Holder in blue pen on the full title page. 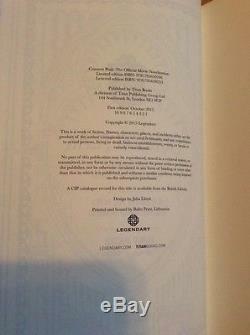 This book is numbered 405/500. This book still has original packaging included. Below is a list of descriptions for the book. I will include a picture of Nancy Holder from this signing event. Please feel free to ask any questions. 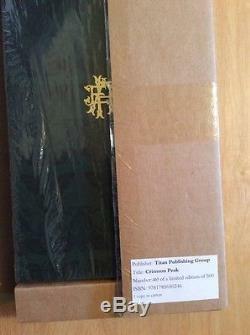 Crimson Peak - The Official Movie Novelization Limited Edition NUMBERED EDITION. 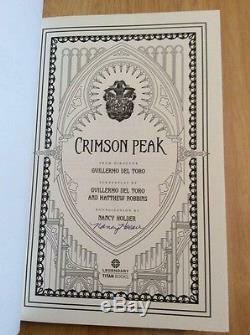 THE OFFICIAL LIMITED EDITION NOVELIZATION OF CRIMSON PEAK SIGNED BY GUILLERMO DEL TORO. 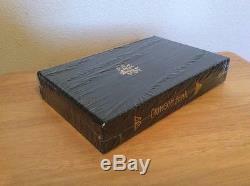 This is the NUMBERED Collectors edition of the Novelisation. Signed by Guillermo del Toro (Tip-in sheet). 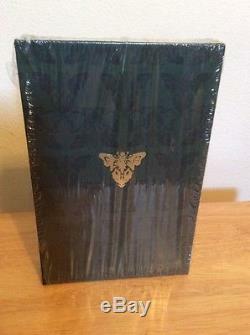 The paper edges of this gorgeous edition is screen printed with a moth motif. Presented with black & white production sketches throughout. 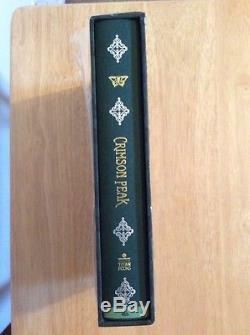 Presented in a uniquely designed slipcase exclusive to the numbered edition. 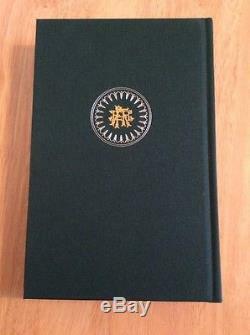 Slipcase designed with soft-touch lamination, debossing and gold foil. 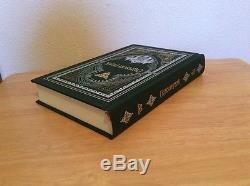 This edition is hardcover the trade edition is mass-market paperback. Limited to 500 copies worldwide. Dimensions 234 x 153 mm portrait, 344pp. Paper stock & weight 115gsm Munken Cream, b&w illustrations throughout. Special finishes 4/4 printed endpapers, screenprinted page edges. Dustjacket green cloth with silver and gold foil. Slipcase specification printed 4/0 on 130gsm gloss art with soft-touch lamination, debossing and gold foil. 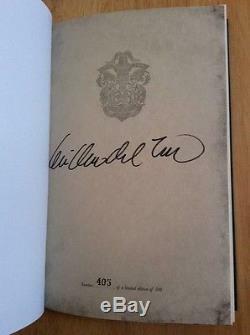 Signed - tipped in, signed by Guillermo del Toro. Limited to - 500 copies. In the aftermath of a family tragedy, an aspiring author is torn between love for her childhood friend and the temptation of a mysterious outsider. Trying to escape the ghosts of her past, she is swept away to a house that breathes, bleeds... This is the official novelisation of the film approved by Guillermo del Toro and Legendary Pictures. 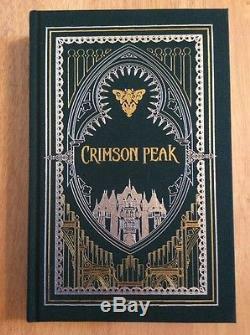 Crimson Peak - The Official Movie Novelization Limited Edition. Specs: 234 x 153 mm portrait. The item "SIGNED x 2 Guillermo Del Toro Crimson Peak Limited Edition 405/500 Titan RARE" is in sale since Tuesday, August 23, 2016. 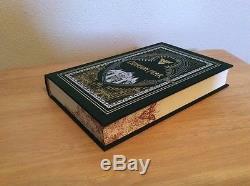 This item is in the category "Books\Other Books". 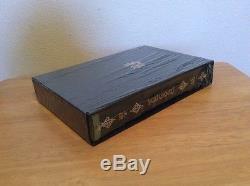 The seller is "bookcrypt" and is located in La Puente, California. This item can be shipped worldwide.